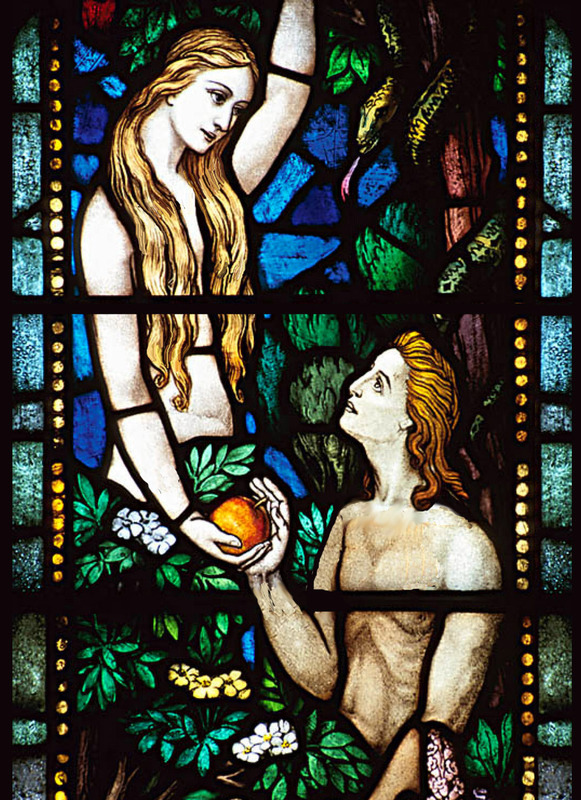 What is exactly going on in the story of Adam and Eve? They were forbidden by God to eat from the tree of the knowledge of good and evil. Presumably this means that, prior to eating from the tree, Adam and Eve did not understand what good and evil were. (If they already understood such things, why would God forbid them from eating from the tree?) But if they did not understand what good and evil were, then how could they know that disobeying God is evil, or to obey is good? Atheists will usually follow this up with the charge that because Adam and Eve had no idea that what they were doing was wrong, God was wrong to punish them (here’s an example). Tell us what you think, and then we’ll hear what Brett thinks on Thursday. Knowledge is not the simple thing most people take it to be. I’ve understood the tree of knowledge of good and evil to be knowledge in the experiential sense. It is one thing for a blind doctor to exhaustively know how sight works in the structures of the human body (“head knowledge”), it is quite another for that same doctor to know what it is like to see (experience). I suspect the same is the case for Adam and Eve. They were told (presumably) that it was wrong to eat of the Tree (head knowledge), but they gained experience by actually doing wrong. That being said, Adam (who is the one by whom mankind’s future was doomed) knew what was wrong and did not trust God at his word. That, not trusting God, is the source and center of all sin. The only problem I have with this answer is Genesis 3:22. If having the knowledge of good and evil means experiencing good and evil in the sense of doing good and evil, then we’d have God doing evil. Genesis 3:22 says, “Then the Lord God said, ‘Behold, the man has become like one of Us, knowing good and evil; and now, he might stretch out his hand, and take also from the tree of life, and eat, and live forever. '” Whatever sense Adam and Eve came to “know” good and evil, God already knew good and evil in that same sense. If it means they did evil, then that means God did evil. So I don’t know if your answer works. I’m not sure that follows, especially taking into consideration the limitations of ancient Hebrew (i.e., no difference between the words “son” and “great-great-great grandson”, no difference between the words “young woman” and “virgin”). My understanding of the text is based off of the difference senses of the word “know” (i.e., a man “knows” his wife certainly is not merely informational). However, that does not preclude an information-only type of knowledge which God would have since by nature He cannot do evil. It is not uncommon to use context to determine the particular use of a word, and your observation very well illustrates that point. I would like to support what Sam has said, in reference to Tazman’s reply to him. In both passages he is referring to (3:5, 3:7 and 3:22), The same Hebrew word is used. The word is the same for when the serpent tells them what will happen if they eat (3:5), the narrative description of what happened to Adam and Eve when they ate the fruit (3:7), and God explaining in what sense Adam and Eve has now become like them (3:22). …you will be like God, knowing (the word is Yada, which according to my NIV Hebrew/Greek Study Bible, is referring to distinguishing between right and wrong in 3:5 and 3:22) good and evil. The man has now become like one of us, knowing good and evil. Now within the span of one chapter, telling the same story, the same word is used for all of the examples cited. Why would you imagine the meaning of the word would be changed when it’s used in the same context and telling the same story? In response to Sam’s reply, I think I has a point, but I would caution making too much of it. First, part of the context is the subject, man and God respectively, and clearly each brings something different to the experience of knowing, whatever that might be. God’s knowing in some cases is only academic (i.e. what it is to sin), but at the same time perfect. Second, we have to be cautious about reading into the text considering it was originally an oral tradition that may have allowed for distinctions between uses of the same word within the text (which the phrase “has become like us” does seem to mitigate against). However, in addition to all that, we have to remember that the original Genesis story probably originated in yet a different language (pre-Babel) which may not have translated well. All this to say, I’m not 100% certain of my own understanding of the text, but I’m not willing to build too much theology on the Genesis passage alone. The original problem, man’s understanding of evil before and after the fall respectively, seems to be answered by the interpretation I’ve offered, although legitimate difficulties have been raised, but not insurmountable ones. Ooops, you say, presumably? I believe that it was very clear to them both. Though God knows evil, for it existed in heaven with Lucifier (I believe all his created beings have free will). He is not tempted by it nor can he do evil (this, every Christian knows). With man being made lower than the angels and with free will, was, as you note, not tempted outright to use his free will to disobey God’s Command . For it was Eve that was tempted, not by the command given by God, but by way the devil phased the question. Thus putting doubt into what God had said. Eve, took and ate- then she gave to Adam and he ate (Oh, no!). I sometimes think, why did Adam not question what was said to Eve? Had he been listening or was he just an innocent bystander, or did he loved Eve so much that he was willing to be with her in whatever they did. Of course, the rest is Bibliclal history. I love the response above! I think that’s right on. Tazman hit the nail on the head as far as I can see. The key to the entire position is based on the fact that God “told” Adam and Eve not to eat of the tree. That being said, they were both aware that they should not do it. So in that sense Adam and Eve knew right and wrong in light of God’s command. They knew that they were not supposed to eat of the tree. The fact that the tree is called the “tree of the knowledge of good and evil” is, in some ways, irrelevant, because the context demonstrates that they had knowledge of God’s command and chose to disobey. If we consider that Adam and Eve were born sinless and perfect, but with the potential to sin, the tree is nothing but a catalyst. The name of the tree may be an indication, as tazman noted, that after eating they would have experiential knowledge of sin, or it may be an indication of the awareness of sin both in themselves and what was to come. Ultimately, though I reiterate: Forget the name of the tree, they were given a command, which God would not have given them if they didn’t understand the need to follow it, and they “knowingly” chose to disobey. God is not at fault; Adam and Eve are. Very well put. I agree on almost every part of it. But to be fair to women, there is no indication that God told Eve not to eat of the tree. In fact, her misstatement when questioned by the serpent (“God has said, ‘You shall not eat from it or touch it, lest you die. '” Gen 3:3) might suggest (although I’m not committed to it) that Adam actually added to God’s command, which was just not to eat of the tree (Gen:2:17). Women get blamed for enough already without us adding this guilt trip too! (Forgive me for the joke surrounding the original sin for which humanity was condemned.) Thank you for adding clarity to my thoughts on this. I’ve heard it said that God’s decision to kick Adam and Eve out of Eden was a punishment, but a merciful punishment. If they “take also from the tree of life, and eat, and live forever” then mankind would have existed in eternal separation from God. So while being kicked out of Eden (because of sin) started a lot of other problems, it also enabled God to start a plan for redemption that wouldn’t have been possible otherwise. I could be way off base here but this just came to mind so I am typing this as I’m thinking it through. Is good and evil different from right and wrong? It is right to obey God, it was wrong to eat of the fruit. Adam and Eve could have know what was right and wrong but by choosing to do the wrong thing, they came to understand what was good and what was evil. Everything that God made was good so Adam and Eve didn’t understand what good and evil was until they did something wrong. Then they understood that there was evil in the world that could tempt them and make them hide from God. By eating the fruit they became selfish, wanting to do for themselves and not for God. I’m rambling so I’ll leave it at this. Please comment and let me know what you think. The consequences of disobedience were well known. Adam was made in God’s likeness and image – he had truth in his innermost being. God told him and Eve to rule over everything that moves on the earth. Doesn’t one have to know the difference between good and evil in order to be a ruler? If all was good there would be no need to have a ruler. The animals were not made in God’s likeness or image – they were spoken into being. They act like animals – not people. They obviously needed discipline or else God would not have given them a ruler. One other thought that makes me shake my head. God made Adam – He formed him from the dust. He breathed life into him. God made this being in His own image and likeness. He was made perfect with his own will. Psalm 8:4-7 describes who man is. All things were subjected to him and put under his feet. He wasn’t made an infant, he was made a man How can anyone be so arrogant to think that this act of creation would not impart truth, but eating a simple fruit would? Kelly, I’m not entirely sure where to begin since your response doesn’t seem to address any of interpretations offered in the previous posts. If knowledge is purely academic, your concern is well placed, but much less so if knowledge referred to in the command is experiential. A ruler does not have to have done wrong (experience) in order to recognize it (academic). Your comment that animals “obviously needed discipline” may not necessarily be true. Discipline and direction are not the same thing, and even in a perfect world direction may be needed to coordinate God’s creation. Discipline, on the other hand, suggests something has violated the moral order in some way, which I’m not sure animals are even capable of. As suggested earlier by Clark, eating the apple was not inherently evil, but a locus for mains obedience or disobedience before God. Sorry for not being clear. I suppose that I don’t disagree with the other posts – I just think that sometimes we need to get out of our humanistic ways of thinking (if that’s even possible). Adam was a perfect man before he sinned. When we think of “experiential” or “head” knowledge – we are coming from a sinful nature prospective. Yes, we are perfected in Christ, but Adam was already perfect. I don’t think we can comprehend how he thought. The one thing that is being overlooked, or maybe assumed, is that Adam didn’t know right from wrong. Just because he didn’t know what evil was, doesn’t mean he didn’t understand the concept of being wrong. Something that is wrong is not necessarily evil. It’s wrong for me to overeat – but I wouldn’t consider it evil if I do. Evil is always wrong, but wrong is not always evil. So you can’t consider them the same. When Adam ate the fruit he knew it was wrong (which was probably not an apple! http://kwinrc.blogspot.com/2011/11/apple-that-never-was.html). But was eating the fruit evil? I don’t think so. The Hebrew word for evil means bad, displeasing, misery, hurtful, vicious and wicked. The Hebrew word for wrong is disagreeable, injustice and false witness. I think Adam did know what “wrong” meant simply because God said it was “not good” (or wrong) for him to be alone (realizing that God spoke with Adam all the time and probably said this to Adam). The Hebrew word for good here means agreeable – so “not good” means disagreeable or wrong. Once Eve arrived Adam knew it was good that she was there (v23). So if you want to address his “experiential” knowledge – he knew it was wrong to be alone just from enjoying the goodness and rightness Eve’s presence. Interesting thing to note here is that Even did not have this “experiential” knowledge. She knew it was wrong to eat from the tree, but maybe she didn’t know from experience what being wrong was like (she was never alone like Adam was). She was wrong to eat the fruit but she wasn’t being evil. Both Adam and Eve were deceived by the serpent but it was not their intent to hurt God. The only one who was being evil was the snake. In response to Sam’s reply, I think I has a point, but I would caution making too much of it. First, part of the context is the subject, man and God respectively, and clearly each brings something different to the experience of knowing, whatever that might be. Why would it be different? I don’t see why you would automatically think this by reading it. God’s knowing in some cases is only academic (i.e. what it is to sin), but at the same time perfect. Where are you getting that from? Sounds like presuppositions being read into the text, to me. But I may be mistaken. Second, we have to be cautious about reading into the text considering it was originally an oral tradition that may have allowed for distinctions between uses of the same word within the text (which the phrase “has become like us” does seem to mitigate against). However, in addition to all that, we have to remember that the original Genesis story probably originated in yet a different language (pre-Babel) which may not have translated well. So there might be intricacies in the “original” oral tradition that were lost when the original documents of Genesis were written? This all sounds like reasons to doubt the Genesis accounts veracity, much less the inspired quality many claim. Did the events described in this bit of Genesis actually happen? All this to say, I’m not 100% certain of my own understanding of the text, but I’m not willing to build too much theology on the Genesis passage alone. I wouldn’t ask someone to build theology on it, just to acknowledge it doesn’t make sense when you read it. The original problem, man’s understanding of evil before and after the fall respectively, seems to be answered by the interpretation I’ve offered, although legitimate difficulties have been raised, but not insurmountable ones. 1) Asserted that the meaning of the Hebrew word for “knowing” means two different things without evidence for such an assertion. 2) Asserted some properties of God’s knowing (sometimes it’s only academic, but it’s perfect). 3) Cast doubt on the inspiration of the original texts of Genesis by pointing to possible problems in translation of the oral tradition to the written version and using that as a possible means to escape this bible difficulty. What I think I see in your responses (to me and others) are tell-tale signs of presuppositions being read into the text. Claiming that God’s knowledge works this way or that way as a means to allow for two meanings of the same word in the same account of one story doesn’t convince me, the person coming to it without that belief. Genesis is it’s own document, it should stand on it’s own. In the same way, how do you know that God’s knowledge is perfect? That’s not in this text we are discussing. The fact that you believe God’s knowledge is perfect is not evidence for anything other the fact that it’s very easy to import one’s own biases and presuppositions that come from other parts of the bible, or perhaps from your own personal take on God, into the text. I would likely agree with the general idea that there are problems of translation in the bible, and in fact, the original stories. My point is that the account given, that we are discussing, when read, doesn’t make sense unless you read into it with all of these other beliefs, which also need independent support. I don’t find your answer to my question at all convincing. OK, Eric, here we go. First, I am not stating that my interpretation is the best, only that it is a possiblilty. Second, of course I am reading into the text. Everyone does, including the person who assumes “to know” has only one meaning. The question is which set of assumptions are you most comfortable with that can be justified. I would say mine are plausible, although they still have problems. Third, I thought the original question was about the justice of God’s punishment of Adam and Eve, not the veracity of the text. Fourth, Genesis is typically accepted as being compiled by Moses as the beginning of the Jewish sacred books. To think that it MUST be taken alone and insight from the rest of the Pentateuch cannot be used in order to gain any understanding is at least ill advised and often disingenuous (but I could be mistaken). As far as “cast[ing] doubt on the inspiration of the original texts”, that doesn’t even follow. If the original texts were understood by the original audience the way I’ve suggested, then there’s no problem at all. Finally, Genesis wasn’t written to convince anyone that God exists or to convert those that rejected Yahweh. It was meant to explain the origins of the Jewish people who already accepted the existence of a Creator. If the reader approaches the text as a skeptic, I don’t expect such a reader to change his view of God or Scripture based on the Genesis text alone. There are multiple reasons why the Pentateuch and the OT and the Bible as whole were compiled as they were. Your assertion that the Genesis text needs additional assumptions that come from outside the text is one of them. Fair enough. I appreciate you admitting to your bias, and I agree that I also have biases about these things, and that will inevitably affect how I understand it. But I don’t think that gives us an excuse to not examine our biases and see if they are rational. The presuppositions we carry into a new idea should not escape scrutiny. We should indentify and interrogate our prejudices and biases about everything. We should also strive to look at things from different angles and viewpoints. I can easily see that you would think the text means this or that based on what (I would guess) you already believe about God and the Bible. And the same can be said about me. But that should not be the end of the story. You agreeing that you have presuppositions that are informing your opinion on this matter is honest, but it doesn’t allow you to still claim your presuppositions as evidence for a conclusion that you reached. The prior belief, about the nature of God’s knowing, and it’s perfection, was a device you were using to help explain why it might mean something different. I wanted some justification for the claim you were making, otherwise I don’t think it’s a useful way to get at the truth. You can find that personally convincing, but you can’t expect someone who doesn’t share your biases to agree with your conclusion. I wanted to point out that in order to make your interpretation seem a likely explanation, one needed to have a lot of very difficult to defend presuppositions already in operation. I think that there is a simpler explanation that explains a lot more of the data and requires very few, easily defended presuppositions. This explanation claims that the Bible is man-made, and not divinely inspired. That is to me, a likely explanation for the scriptural difficulties. But that’s not really what we are talking about, and this particular passage is a very minor example in my opinion. I would also like to point out that I never claimed that “to know” has only one meaning. What I said is that the Hebrew word was the same in all three passages, the context was the same, and the wording was similar in two out of three of those cases. My study Bible says that in 3:5 and 3:22 (which links what the serpent said would happen and what God said did happen) the meaning of the word there was “distinguishing right from wrong.” That doesn’t prove it, but it does lend weight to there being a real problem here. I was only expressing skepticism about your reasons to think the meaning would be different. I wanted to know why someone who isn’t starting from the assumption that the Bible is divinely inspired could come to the same conclusion as you. I agree that the question was originally about God’s punishment, but I think the question of the text originally arose from what you said. By claiming that it could have meant something else, or perhaps there were subtleties in the original spoken word that didn’t survive the lower fidelity translation, it felt like you were saying that perhaps we shouldn’t trust that the Bible is an accurate retelling of those events. But I think questioning the reliability of the account is a valid process and a good thing to do, and seems to me that most detached investigators would do so. These challenges are about giving answers to skeptics. I assume that a redeeming property of these answers is that they should be convincing to the audience they are intended for. So when you say that you have presuppositions that allow you to read this text without thinking there is a real problem, I, as the skeptic, say that I think you should provide evidence for your presuppositions if you want me to be convinced. Finally, I would like to add that while these discussions are often heated and emotional, I have so far enjoyed a level headed argument with you. I would like to keep it that way, so if I cross a personal line or seem to insult you, I assure you it is unintentional. Please let me know if that does happen, ok? Eric, I could not have written a more even handed response if I was a professional diplomat. I apologize to you if my last post seemed a tad antagonistic. Mea culpa. I’ve been enjoying this back and forth too. Let me ask the following: in regards to the characterization of God’s knowledge offered, do you reject the idea that it is academic or that it is perfect? Since we agree that we both are bringing assumptions to this, I’ll be glad to defend mine once I know what you are objecting. However, seeing as you are the one bringing a “non-traditional” view to interpreting the Bible, I would suggest you are at least as obligated to offer an explanation for you assumptions as I am. Once I know what your objection is, I’ll be glad to attempt to defend exactly what it is you are challenging. I was not originally objecting to a theological claim, but to your methodology in coming to the conclusions that you did. I am simply skeptical of the reasons you gave why it should be reasonable to think that two different types of knowledge were being discussed in the passage. I am not a Hebrew scholar of course, so I can’t really say what the word means in different contexts. What I’m going on is the different translations of this passage (in order to look for nuances in the reading as a clue to other possible meanings), easy to access study guides and notes in said translations, and my own nature of not believing things on unconvincing evidence. To me, the idea that the resolution you offer to this biblical difficulty won’t be convincing to people unless they already accept other theistic presuppositions sounds suspiciously like a no-evidence claim being held up by ever-slightly more reasonable but ultimately no-evidence claims. If someone doesn’t believe in God, and has a problem with this passage, telling them they really need to believe in God first in order to understand why this scripture makes sense sounds like a really bad way to do it. When I use to witness to Mormon missionaries, I remember they would often not want to discuss problematic doctrines or passages, explaining that they would only make sense if I understood other, more foundational beliefs. They promise all questions will be answered if you trust them now and just believe despite your objections. That sounds similar to what you are saying. That’s a non-starter for me. Too many unanswered questions add up to a lot of doubt, and this seems to be just another unanswered question for me. “Now within the span of one chapter, telling the same story, the same word is used for all of the examples cited. Why would you imagine the meaning of the word would be changed when it’s used in the same context and telling the same story? Please explain, in accessible terms, why I should also think that this meaning changes in the manner you say it should. Why shouldn’t I think it has the same meaning? God is never wrong. he would have had a reason for punishing Adam and Eve. Even if they didn’t know good from Evil i’m sure they still would have to listen to god and do what ever he says even if they did not know if they were doing the right thing or wrong thing. They both did not listen to god and that is why he thought necessary to punish them. Remember that God is only human through Jesus and that he is the creature the lord and the one who always knows all. He Really Is Perfect.